My research takes me in and out of neoslave narratives written by African American women, specifically Octavia Butler. Her time-travelling novel Kindred likely stands out in the memories of most people familiar with these narratives, but her 1980 novel Wild Seed re-envisions and re-imagines slavery, the Middle Passage, and the experiences of US enslaved women. Why isn’t this novel Butler’s most discussed, most published, most researched work related to slavery? 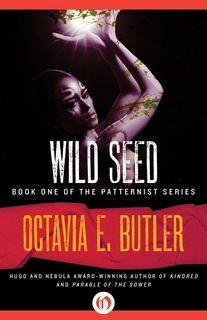 Wild Seed begins in Africa circa 1690 with Anyanwu, a shape-shifting 300-year-old woman who encounters Doro, a spirit who exists by stealing the bodies of individuals he desires. Doro wants to use Anyanwu, a being he identifies as ‘wild seed,’ and her incredible powers to create a community of super beings in the US. She accepts his offer to travel and live in this new community across the ocean. Anyanwu must travel to the US on a ship, and at the ocean’s edge she is horrified by what she sees and hears: the pained cries and horror-struck wails of Africans as they are branded as slaves and bound for the Middle Passage. Butler contrasts the images of the Atlantic slave crossing with Anyanwu’s experience aboard Doro’s ship where individuals walk freely. History is rife with instances of enslaved individuals escaping to their deaths into the ocean, and of the terrifying stories of African men, women, and children thrown overboard by white slavers; Butler creates an alternative for her female protagonist. During the journey, Anyanwu encounters dolphins and is able to shape shift into this new creature. She dives into the water and interacts with the dolphins. “Swimming with them was like being with another people. A friendly people. No slavers with brands and chains here.” Butler signifies and re-imagines the Middle Passage for Anyanwu and creates a narrative in which suicide and murder by drowning for enslaved African individuals transforms into a liberating and powerful experience for this African woman.